On September 10, 2017 Rosewood Baptist Church in Columbia SC undertook a relaunch and rebranding of the 80-year-old institution. 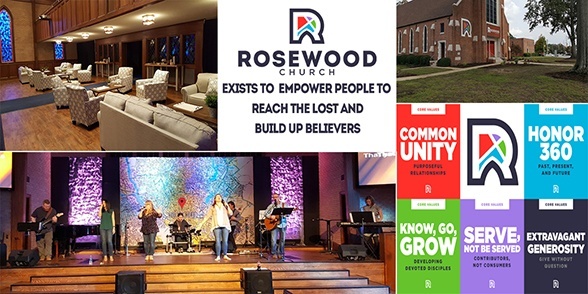 The new “Rosewood Church” presented new core values and vision, with a modern logo and graphic brand as well as changes to its campus and sanctuary. The church now embraces a unique and relevant, blended worship experience that connects with the community context. The church has seen over 100 first time guests in the last eight months and new families are taking ownership in the vision every month. This new focus is drawing generational and ethnic diversity, allowing the inside of the church to reflect the community outside the church. Rosewood is resurging both spiritually and numerically. Bob’s first ministry opportunity was serving as an associate pastor with Pastor Greg Dowey, who he still considers his mentor and pastor, at Friend Church in Irmo. 2012, Friend Church merged with Fellowship Church in Dallas, providing the Texas megachurch a Columbia satellite. “I served there about another year. I knew God had called me to ministry, but not to that megachurch structure,” Bob adds. He worked in the private sector until rejoining with Pastor Dowey, who had also left the megachurch a few months later to plant Fresh Church, a growing church community in Irmo SC. After sixteen months Pastor Greg felt lead to focus exclusively on Fresh Church. Bob was working with both churches as well as a nighttime security guard to make ends meet when Rosewood asked him to stay and lead the church. “My wife Janis and I prayed about it and committed ourselves here. My first Sunday was Easter 2015. I wasn’t looking to be a lead pastor. I didn’t seek out this position. I was happy serving my pastor and my church. We knew this would be difficult; Rosewood had seen some tough times and had developed a reputation that was not healthy. When I arrived, people said it would take an act of God to turn Rosewood around, and that is exactly what happened.” In fall 2015, Columbia experienced a 1,000-year flood event with over 20 inches of rain. That storm and Rosewood’s response to it marked the start of the revitalization. “The morning of the flood the roads on either side of Rosewood Drive were under water. I got a call from Bill Dieckmann who said the Metro was already helping displaced people and asked if Rosewood would help. That is when we started our culture of ‘YES.’ Here at Rosewood if our community ask for something we says ‘YES.’ If it doesn’t compromise our Christian values, we will do anything to help people connect to Jesus. We know we can’t do everything, but we can do something, and what we can do we will do!” The church took in people from flooded shelters, and their gym became a temporary homeless shelter.